I love the colours in this dish, the contrasts make it so eye catching. The hummus can be made in advance and stored in the fridge for up to three days. Bring to room temperature and garnish before serving. Boil the beetroot, unpeeled in salted water with a dash of red wine vinegar until soft. Cooking times will depend on the size of the beetroot but it should take about 40-60 minutes. To see if it is cooked insert a sharp knife into the beetroot, it should feel tender. Once cooked, allow the beetroot to cool in some iced cold water then when it is cool enough to handle, rub its skin off with your fingers under a running cold-water tap. Drain and rinse the chickpeas under a cold-water tap using a sieve. In a food processor blitz the chickpeas, using a spatula to push any chickpeas which may have stuck to the sides down. Blitz the chickpeas until you have a very fine consistency. This should take at least three minutes, if not longer. 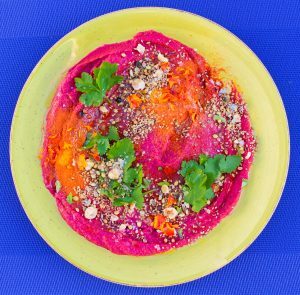 Once the chickpeas have formed smooth paste, chop up the beetroot and add it to the blender. Continue to blitz the mix until the hummus is completely smooth. Add salt and pepper and the juice of half a lemon then check the seasoning. Transfer the beetroot to a serving plate. I like to smooth it out over a plate so that the garnishes are more prominent. 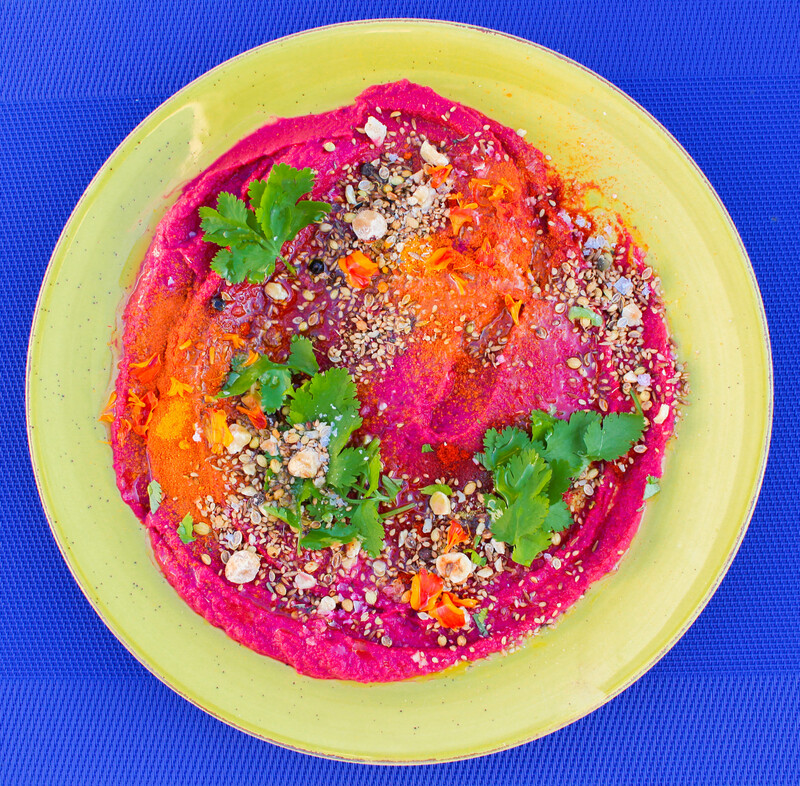 Take the dry spices, a pinch at a time and drop them over the top of the hummus creating pockets of colour as you go. Add some chopped coriander leaves and the dukka. Pour over a glug of good quality olive oil and some salt and pepper to finish then serve at room temperature.